If the US wants to keep using a drug war air base in Ecuador, it must let Ecuador open a military base in Miami, Ecuadorian President Rafael Correa told Reuters in an interview in Italy Monday. Correa, a popular leftist leader, promised during the 2006 election campaign that he would never renew the 10-year lease for the air base at Manta, in northern Ecuador. "We'll renew the base on one condition: that they let us put a base in Miami -- an Ecuadorian base," Correa said in Italy. "If there's no problem having foreign soldiers on a country's soil, surely they'll let us have an Ecuadorian base in the United States." US officials consider Manta critical to anti-drug surveillance on Pacific drug-smuggling routes. The lease on the base, negotiated with a previous government, is set to run out in 2009. Correa said earlier that he would chop his arm off before he renewed the lease. According to a US embassy in Quito fact sheet, over 60% of illegal drug seizures in the eastern Pacific in recent years resulted from intelligence gathered thanks to the air base. The fact sheet said that 15 permanent and up to 150 rotating US military personnel involved in anti-drug activities are stationed at the base at any given time. The fact sheet sought to portray the base in the best possible light, even resorting to noting that the base's "full-time Ecuadorian employees include persons with physical challenges whom the [base] is helping to integrate into the workforce through an innovative program" and that the base "provides financial support to multiple local charities in an effort to be good citizens and guests in Manta. US personnel help tutor English in a local community center and support charities including orphanages and a school for children with disabilities." But embassy PR wheedling notwithstanding, Correa is tapping into broad public resentment of the base, much of which is rooted in dislike for Plan Colombia and suspicion about what other uses the US could put the base to. 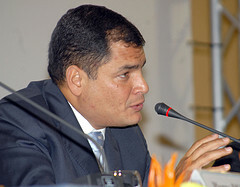 Correa campaigned strongly against Plan Colombia in the 2006 election, as tensions between the neighbors heightened over US-backed aerial fumigation of Colombian coca groups and its impact on adjacent Ecuadorian territory. "The nationwide position not to involve Ecuador in Plan Colombia is the first reason why Ecuadorians do not want the US military to remain in Manta," Fredy Rivera, professor and researcher with the Ecuadorian branch of the Latin American University for Social Sciences, told ISN Security Watch during a recent interview. A second reason for Ecuadorian opposition to the base was suspicion over US plans, he said. "The surveillance equipment can be used to watch activity in Colombia, Peru, parts of Venezuela and Bolivia, and of course Ecuador," Rivera said, adding, "this is official discourse." But even though Correa is refusing to renew the base's lease and has publicly called President Bush a "dimwit," he rejected the idea that rejecting the base should hurt US-Ecuadorian relations. "This is the only North American military base in South America," he said. "So, then the other South American countries don't have good relations with the United States because they don't have military bases? That doesn't make any sense." do you have schools that teach geography there too? Because you may want to audit a class or two. the fact they flaunt how much legitimate good the u.s. is doing doesnt negate the fact they might also be up to "no good", activities that are prohibited by agreement between the two countries. i can understand ecuador's concern. I think I could talk my hometown in Idaho into hosting an Equadorian Air Force Base. We are about 100 miles from a USAF base, they could do joint training. Maybe the Equadorian Prez has a secret desire to visit Miami a lot though. They need a base in Miami to keep track of those CIA connected planes dropping out of the skies with TONS of coke, like Gulstream business jet N987SA, or Donna Blue Aircraft's DC9 busted with 5.5 tons. President Rafael Correa is 100% correct. The U. S. presence in Manta needs to go. American tax dollars go down the drain while the U. S. violates Ecuadorian sovereignty. We need to cut our number of foreign bases way down. If the US took all of the Plan Colombia money and invested it in drug treatment, education and border control, they could eliminate the demand which keeps the Colombian narco-traffickers in business. Of course, that would hurt the military defense contractors who get rich off of this baloney, so it will never happen. New businesses containing just a few people are not advised to be working on one's roof. There are industry leaders when it comes to Charlotte metal roofing companies. This number illustrates that Stanley is not only rising nicely, but is undervalued relative to this expansion.